A block diagram cartoon of the Rio Grande Rift shows how crustal extension localizes sedimentation and volcanism within and along the rift margins. 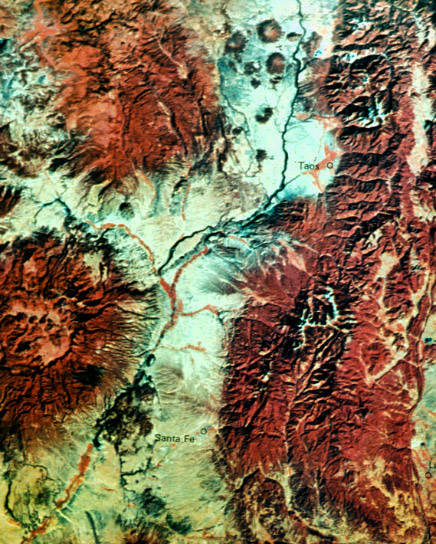 In this false-color LANDSAT image of north-central New Mexico, vegetation is red (mostly defines the mountains) and the basins of the Rio Grande Rift are light-colored. The San Luis rift basin (central upper part of image) is separated from the Española rift basin (center and lower left of image) by the Embudo fault. Note that the Rio Grande bends west, parallel to the Embudo fault. Valles Caldera (an extinct volcano) is the circular feature on the left side of the image.